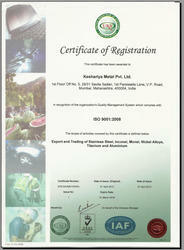 Incepted in 1999, we, Keshariya Metal Pvt. Ltd., are an ISO 9001:2008 certified company that is known for supplying, trading, and exporting of a massive array of non ferrous metal products. This offered range of products offered by us includes Inconel 625 Products, Inconel 718 Products, Inconel 800 Products, Monel 400 Products and Monel 500 Products. These are manufactured in adherence to the predefined industry standards at the vendor’s end. Owing to the anti-corrosive properties and durability of these products, these are highly acclaimed among the client base we have reaped so far. In addition to this, to meet the diverse requirements and demands of our clients, we make the offered range of the steel products available in various sizes and dimensions. Confiding on the credible vendors we are associated to, we ensure a range of utmost quality for our revered clientele. Manufactured using the premium quality raw materials at the vendor’s end, we assure an optimum range of products for our prestigious clients. Finding vast application in pollution control equipments, nuclear reactors, and aerospace industries, the whole range of the qualitative products offered by us has fetched high demand in the market. Under the mentor-ship of Mr. Mayur Jain, we have accomplished in developing a strong foothold in the industry. His rich experience and leadership qualities have enabled us in touching the dimensions of success. Committed to follow the fair business practices, we have accomplished in attaining the maximum trust of our respected clients. We export our product in all over the world. Owing to the expertise and experience of the skilled professionals we are manufacturing, supplying and exporting these products in small as well as huge bulk as per the needs of our valued customers. A team of experienced professionals and enthusiastic youth members works with complete dedication and devotion to achieve their targeted goal and attain maximum satisfaction of our customers. All the team members work in close proximity for the beneficial output. At our premises workshop is also being held on regular basis for the improvisation of the business. We are a highly acclaimed name to offer an extensive range and qualitative of steel products. This offered range of products is manufactured in compliance with the set industry standards. Our team of quality controllers checks the whole range of steel products on various parameters and further ensures the premium quality for our respected clients. Being a client-centric organization we ensure the supreme quality of the products to be offered at prime. We are highly pleased to be associated with a credible vendor base that aids us in delivering an optimum range to the revered client-base we have accomplished to garner. Followed by vast survey and research, we have joined our hands with the prudent vendors in the market. The vendor base we rely on manufactures the entire range of the steel products offered by us using the high-grade metals and alloys. Driven by a client-centric approach, we are committed to offer a range of supreme quality to our prestigious patrons. Relying on the trusted vendors, we assure a range of premium quality of the entire range of the steel products offered by us. The fair business practices we follow have further enabled in attaining the maximum satisfaction and trust of the clients we have. Owing to the quality we offer, we have been a preferred choice of our respected clients. We are known for offering a qualitative range of steel products in the market. Aided with the dexterous team of experts, professionals, and procuring agents, we are capable of serving the demands and requirements of our valued clients. Owing to the premium quality of the products, the whole range of the products offered by us is highly regarded in the market.